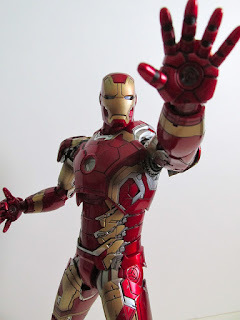 Hot Toys is on a roll with Marvel, and they look to start really cranking out these figures quickly. Originally, this figure was supposed to come out sometime in August or beyond, but they have surprised many and have bumped up this release to May. 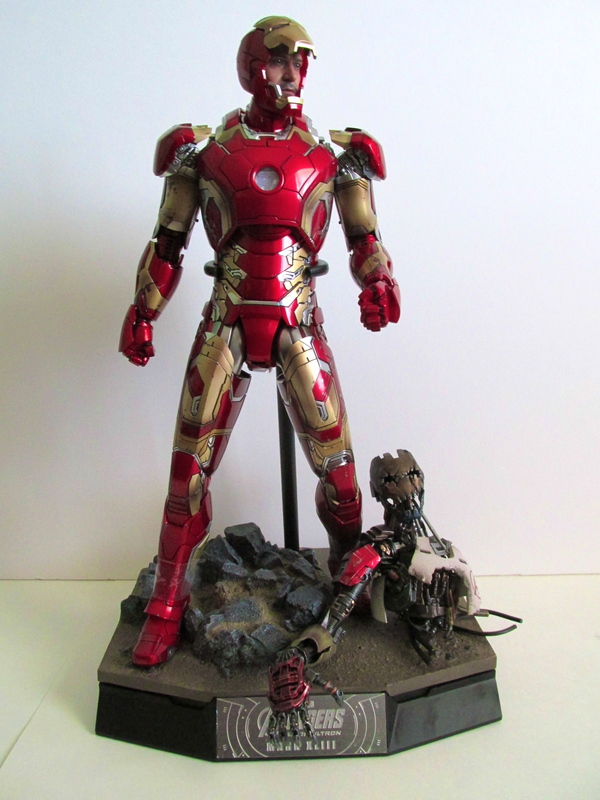 The Mark 43 is essentially a repaint of the Mark 42, which can explain why this figure came out so fast. I’m really liking this simple repaint of the Mark 42, and I’m amazed just how a repainting the color scheme of an armor could look so different. The repaint on this is simply taking anything that was gold and painting it red and anything that was red is now painted gold. 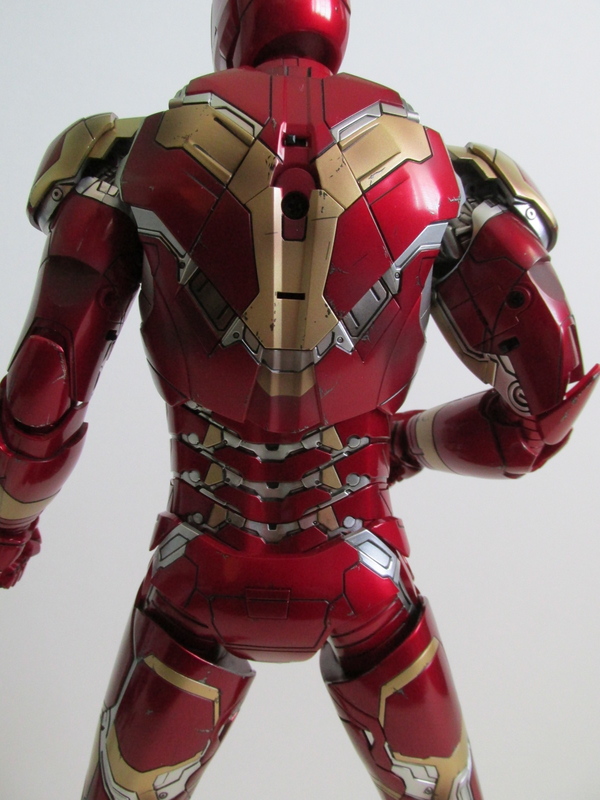 There are also some minor scuffs and scratches throughout the armor to create a worn and used look. 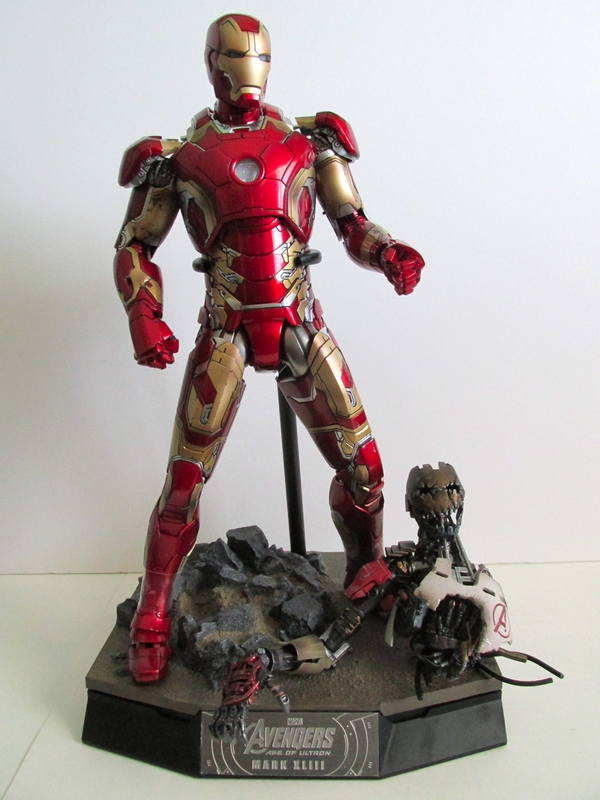 The face sculpt for this piece is again the same as the Mark 42, but there is no blood on his face. 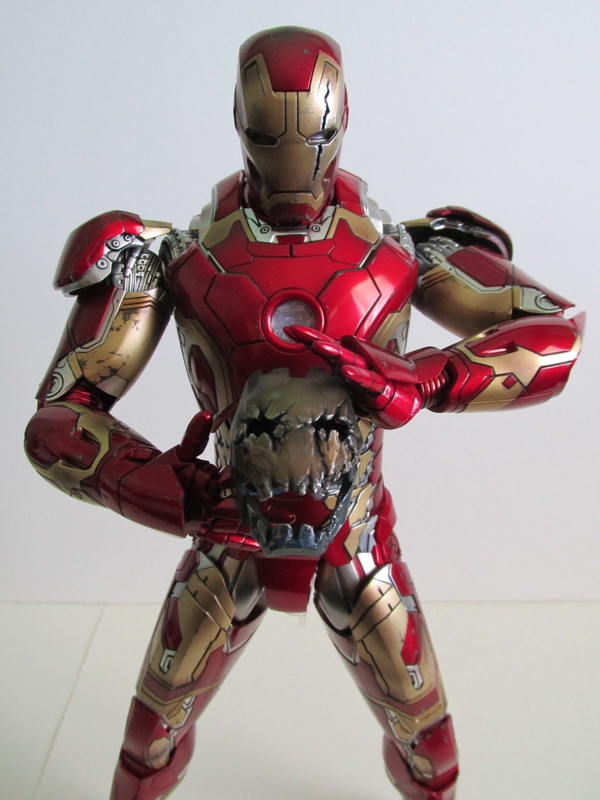 Still look goods and is the standard flip up magnet face plate that we have come to expect from Iron Man figures. Accessories wise he comes with a special base with rocks on it, the torso and head of Ultron Mark I, repulsor hands, articulated hands, fists, right forearm rocket, and the exclusive version comes with a scarred, red left eye helmet. 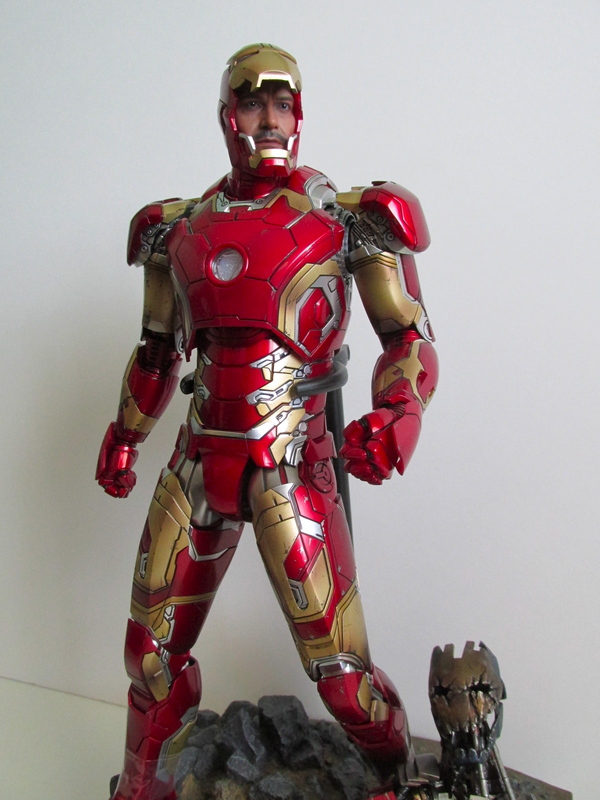 The Ultron Mark I accessory is great and another welcome addition to this figure. You can take off the head and arm and pose them with the figure. Otherwise, the head can move left to right and the arm can move slightly. The exclusive version came with the scarred, red left eye helmet. This wasn’t seen in the movie and most likely a deleted scene. It seems in general Marvel changed their minds last minute on merchandising for this film and you’ll notice with other available merchandise from other companies that there are looks and accessories for characters that were not seen in the film. I.E. the savage grey Hulk Funko released as an exclusive. I’m guessing this scarred version of the helmet might have been seen in one of Scarlett Witch’s dream sequences hence the red light up eyes in the helmet. 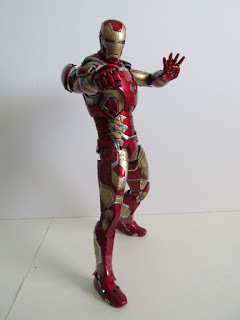 This is a great look for the figure and again a nice touch. The only thing I had a problem with was putting in the batteries into the helmet. The magnets are strong enough to pull the batteries away from your hand so it’s really difficult to put in the batteries. Overall, I like this figure, and I’m excited for the rest of the Age of Ultron figures to create the Avengers line up in the film. Unfortunately, the exclusive version is sold out, but you can still get the regular version.